Whether you are missing teeth from advanced decay or trauma, Dr. Steven M. Balloch understands the impact this can have on your life. Dr. Balloch offers porcelain dental bridges at our Hartford, CT, practice to address the effects of tooth loss. Today's high-quality bridges are crafted to look more natural than ever before. Has it become difficult to speak or eat because of your missing teeth? Could your smile and appearance be enhanced with a porcelain bridge? If so, you may be a candidate for a porcelain bridge. Improving your appearance is a strong reason to consider a dental bridge, but candidates for traditional bridges will also need at least two healthy teeth (abutment teeth) on either side of the missing tooth or teeth. Dental bridges are not suitable for patients who need corrective procedures such as root canal therapy, as it may lead to infection or other complications. Additionally, patients with weak or brittle teeth may not be candidates. Patients who are interested in a more stable restorative solution may consider a bridge supported by dental implants. This type of bridge does not require the alteration of surrounding teeth, and it also stimulates the jawbone, guarding against the deterioration that occurs after tooth loss. Maintaining a healthy jaw can preserve the health of your remaining teeth. Whichever bridge you choose, our warm and educated staff will work closely with you to determine the right restoration for your needs. Porcelain bridges can be designed and placed in as little as two office visits, but additional appointments are sometimes necessary. The first step will be to prepare the abutment teeth (the teeth that will hold the crowns and bridge in place). These teeth are reshaped by gently removing enamel, creating a secure fit. The next step is to make impressions of your teeth. 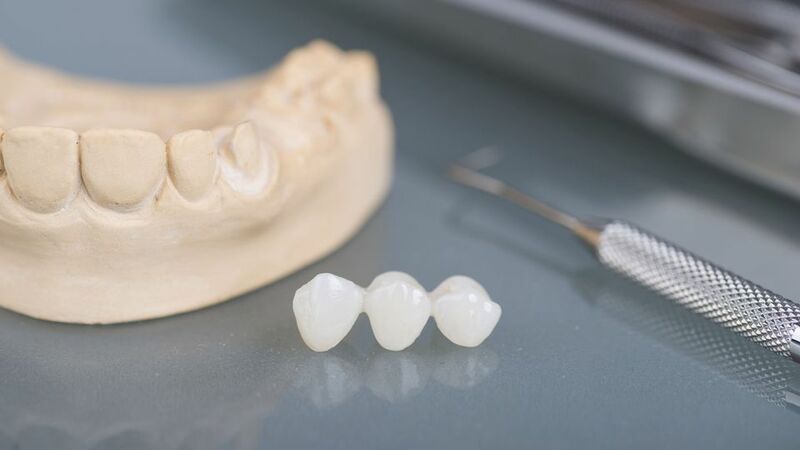 The pontic (fake tooth) and crowns will be modeled after these impressions. Dr. Balloch will provide the lab technicians with photos and detailed instructions on the aesthetics of your smile. Meanwhile, you will be provided with a temporary bridge to protect your teeth and fill in your smile until your new bridge is complete. Your next visit will consist of checking the size and fit of your new porcelain bridge. Your bridge will be adjusted to ensure your comfort. Once we make sure your bite is properly aligned, your bridge will be bonded into place. Finally, your new restoration will be ready and you can begin to enjoy all the benefits of your porcelain bridge. Missing teeth not only impacts your physical appearance, but can also have a significant effect on your self-esteem. Fortunately, the aesthetic oral and facial enhancements created by porcelain bridges will naturally boost your confidence, heighten your spirits, and revitalize your outlook. You may have an easier time speaking, which makes social encounters something to look forward to. Missing teeth can sometimes make the skin on the face appear droopy. However, replacing these teeth can act as a facelift, and patients often report looking younger after receiving bridges. You may have an easier time speaking, which makes social encounters something to look forward to. Dental bridges also help maintain oral health, which is compromised by tooth loss. With a restored bite, you can eat a wider variety of foods, and you will be able to chew sufficiently, which is crucial in aiding digestion. Improved oral health is essential to maintaining good overall health, making bridges a worthwhile investment. The abutment teeth may be susceptible to decay. Fixed dental bridges cannot be removed, making them more difficult to keep clean. Bridges last a long time, but will eventually need to be replaced. Our friendly and informative staff will make sure you know all potential risks before proceeding with any procedure. We know how bothersome missing teeth can be, and we are ready to begin planning your transformative procedure today. Contact our practice to learn more about porcelain dental bridges.